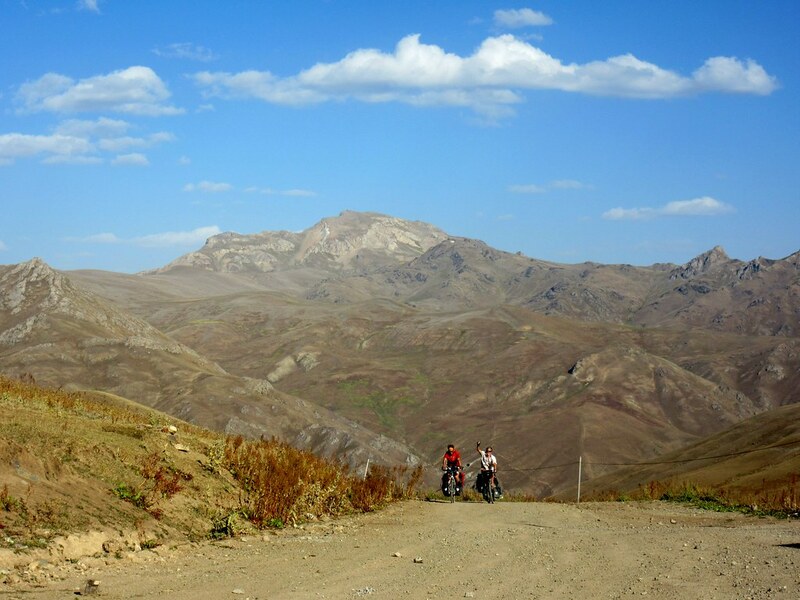 After a couple of days off in Khorog we were ready to tackle the final leg to Dushanbe. 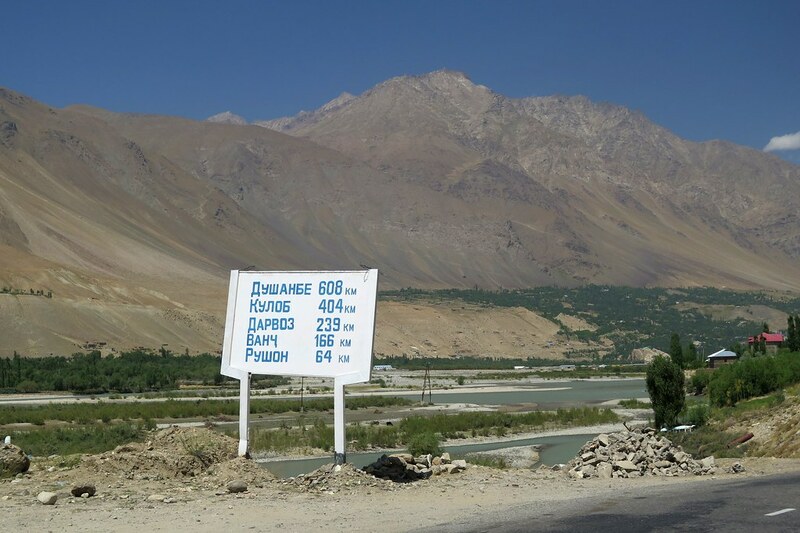 This stretch, although technically part of the Pamir Highway, doesn’t have the high altitude passes and we didn’t really know too much about the road ahead. 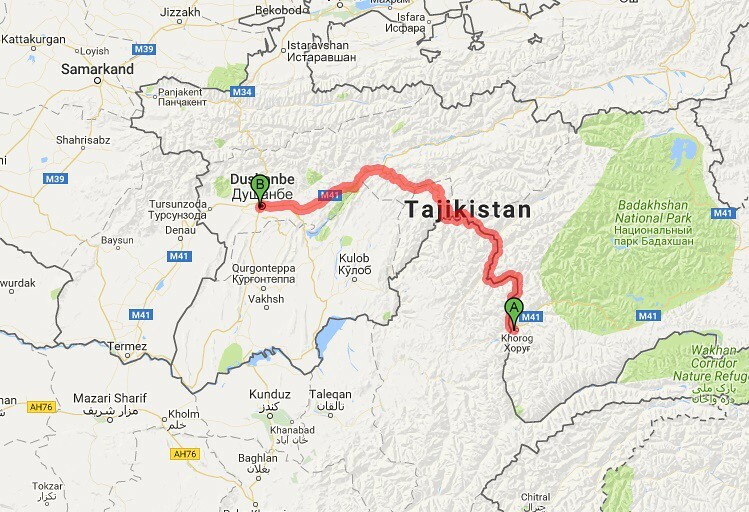 We’d heard there is a northern route and a southern route to Dushanbe, the northern being shorter but tougher. Riding out of Khorog a road sign told us Dushanbe was 608km away. Presumably this is on the southern route, as we took the north route and covered 524km. 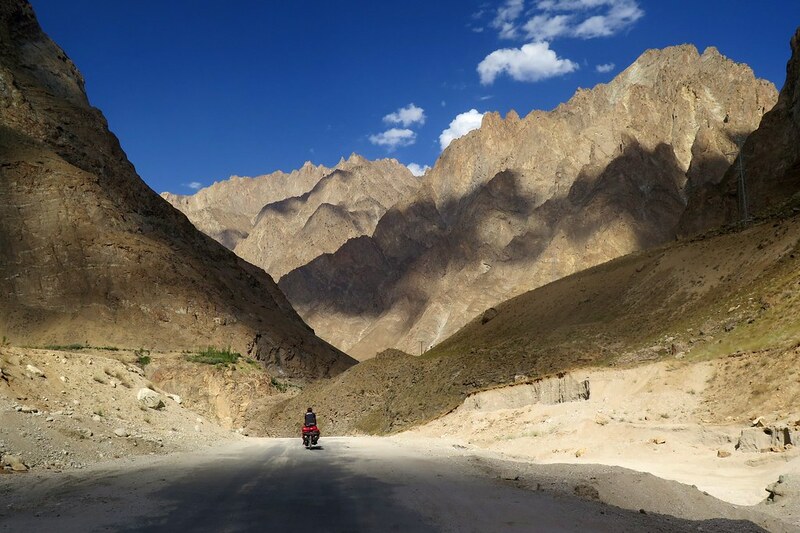 Initially the road was similar to the ride in to Khorog from the Wakhan Valley. The surface was good and it followed the Panj river with Afghanistan just over the water to our left. We’d left quite late after a lie in then a trip to the supermarket and petrol station to stock up our supplies. 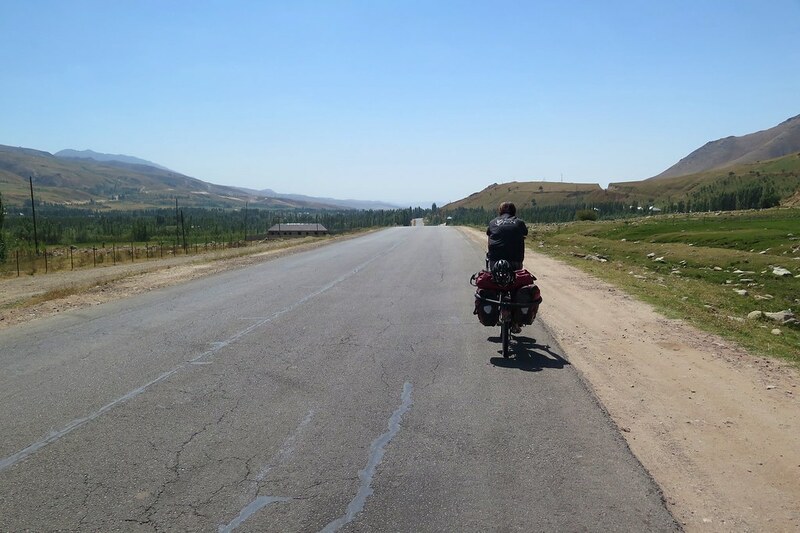 Through the afternoon we met a few cyclists coming the other way, full of questions for us about our ride from Osh. 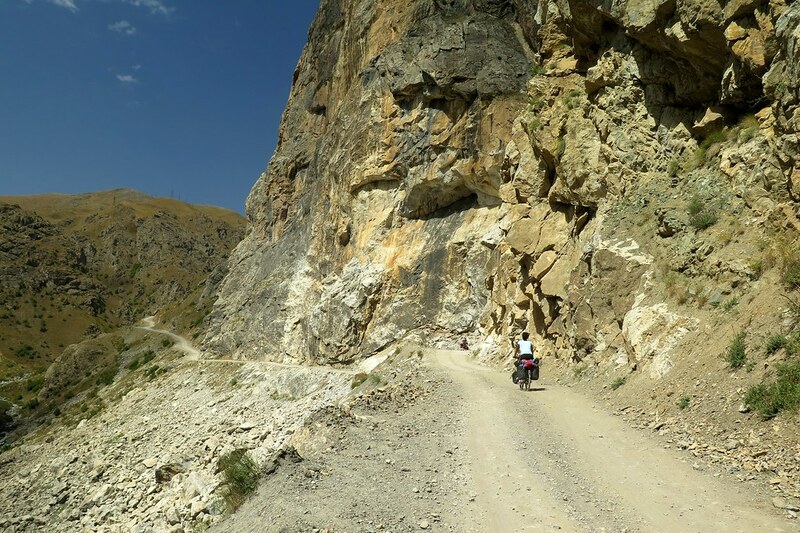 Suddenly we’d become the experienced veterans who’d finished the Pamir Highway proper. The river gorge was very narrow at points, not really presenting us with many camp spots when we started looking for somewhere to stop later in the afternoon. Eventually, just before Roshan we saw a grassy spot next to the river where we pulled in. For a change, our panniers were full of fresh veggies thanks to the supermarket in Khorog so our dinner was significantly more colourful and healthy than what we’d been eating for the previous couple of weeks. Roshan was a nice little town and was full of cyclists all stopping off at the magazins when we rode through the next morning. We met Jin, a South Korean girl who’s been touring on her bike for four years! We’d been following her on Instagram (@universewithme) so it was nice to meet her in person. Other countries were represented too, we met a Taiwanese, a Brit, several Belgians, a German and a group of four French on recumbent bikes that day. You always ask about the road ahead when chatting with other cyclists, but it seems like the answer always varies. 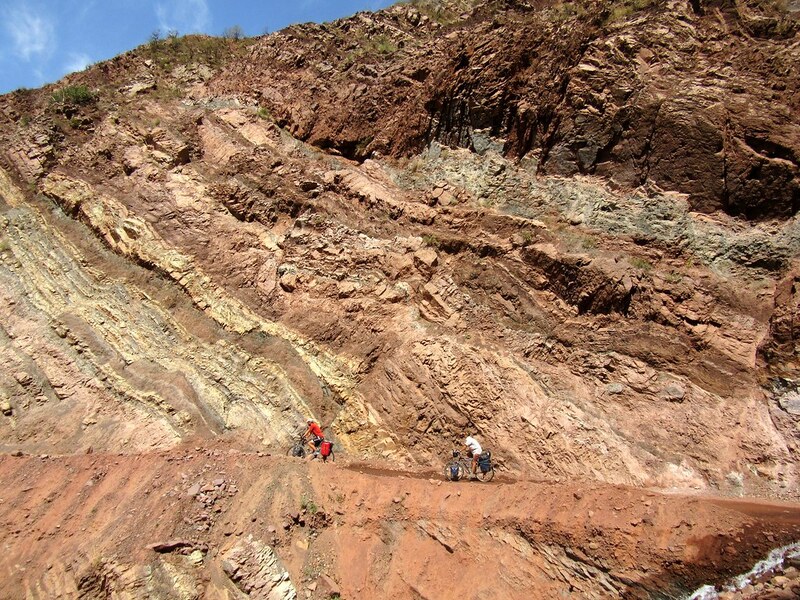 Some said the road was great for the next 100km, others said it was terrible and rocky. 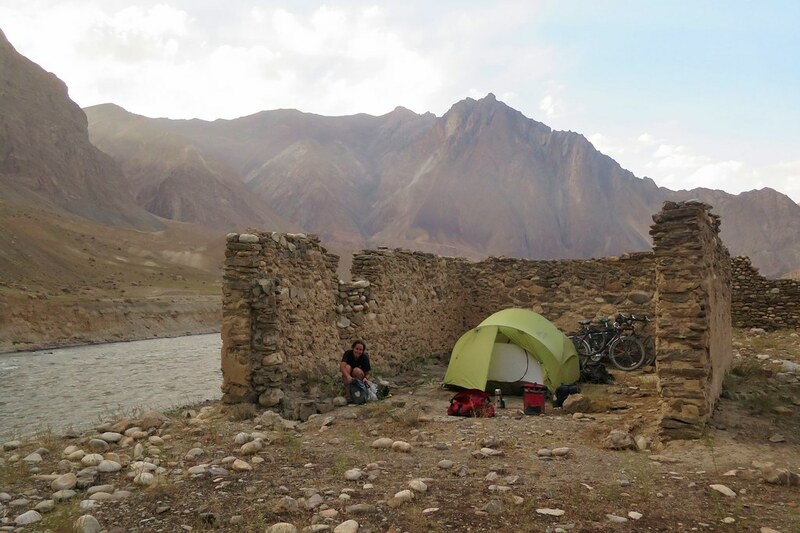 Luckily, the surface stayed reasonable for a lot further than expected, so we were able to cover more distance each day than we did in the Wakhan Valley. The scenery was much better than expected too. We didn’t have the huge mountains around us, but the gorge was narrow and rocky, its walls towering high above us. 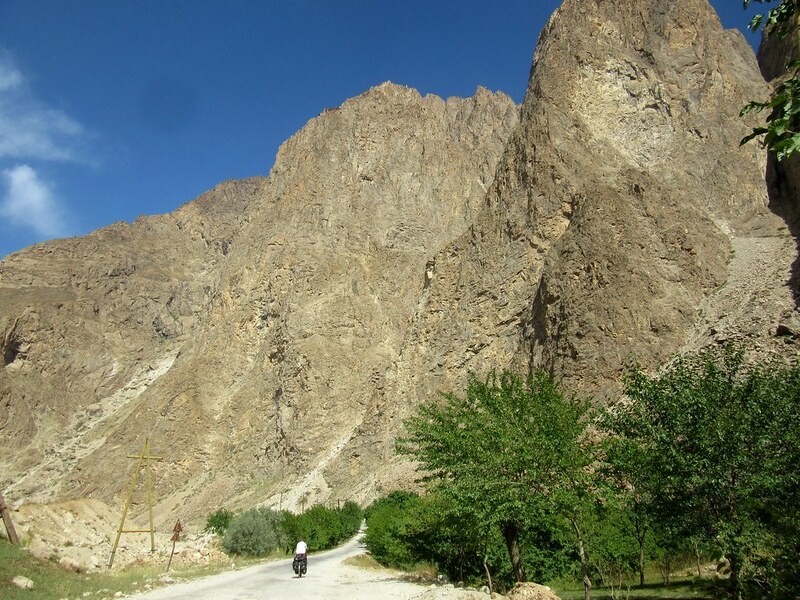 For the next couple of days to Qalai-Khumb we followed the river through the valley, passing the occasional village. 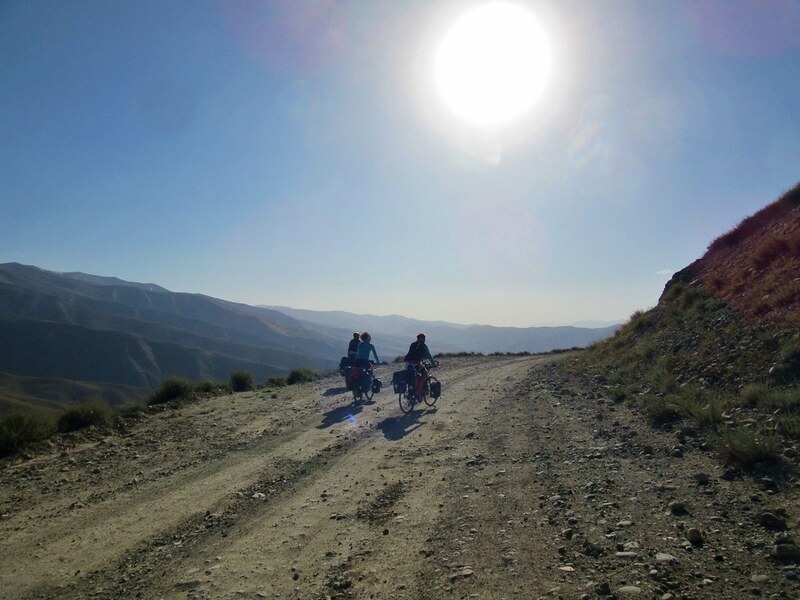 The road did deteriorate eventually making some of the short sharp climbs quite tough, but it was rarely as bad as in the Wakhan. 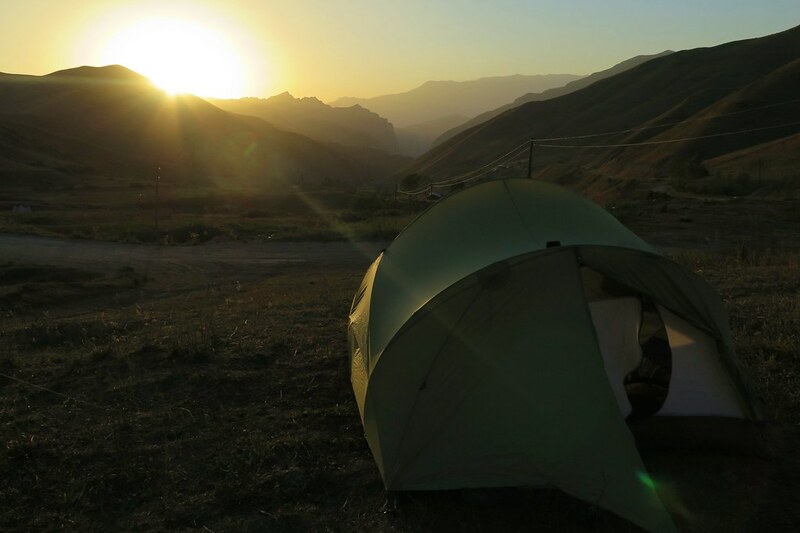 Camping was trickier as there was more traffic and fewer open spaces close to the road, so we seized whatever opportunities we saw, behind boulders or in the ruins of old farm buildings. 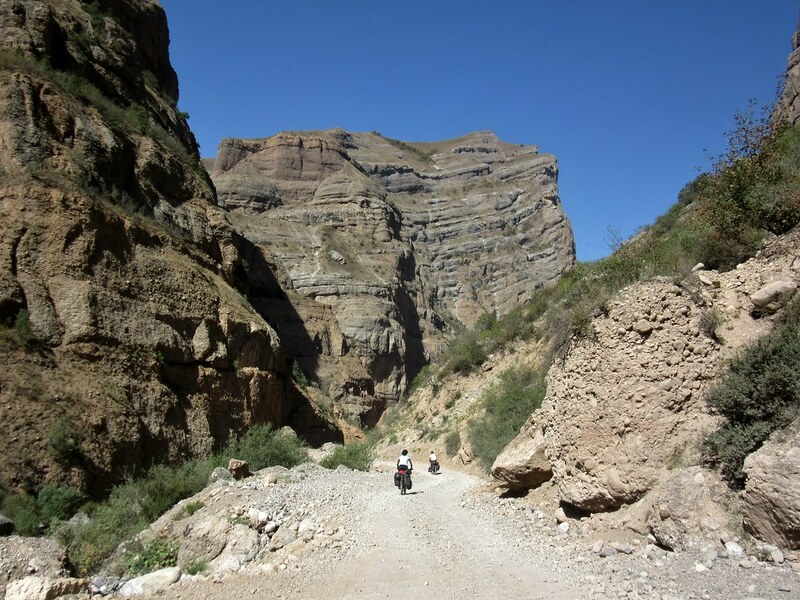 The last 50km into Qalai-Khumb proved to be quite a challenge. We were hoping for a short, cruisy day ending up in a guesthouse and a beer. Even as we set off in the morning, it was hot and humid. 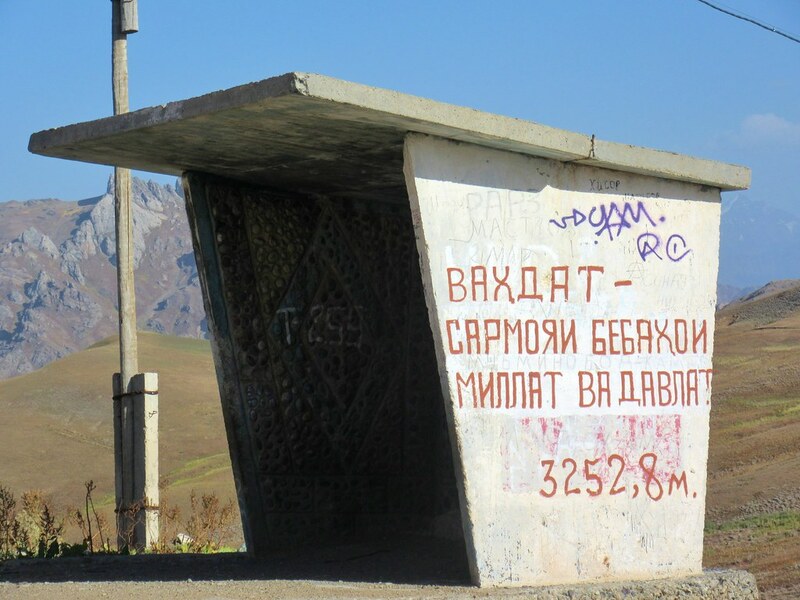 We’d been constantly losing altitude ever since we left the high Pamir plateau and this was the lowest we’d been for a couple of weeks. We had a lot more ups and downs that day too, slowing us down. Added to that, early in the day, I noticed Clare’s rear tyre (I’m always behind on the climbs!) was going flat. It was a slow puncture, which meant stopping every 5km or so to pump it up. I didn’t want to sit out in the sun changing the tube! After a few hours in the saddle, and later than we’d hoped, we got up the final climb and rolled down into town. We were covered in grime and our chains were rattling and clicking thanks to all the dust on the road and in the air. As soon as we arrived on the main street, a young kid grabbed us, shouting ‘Guesthouse! Guesthouse!’ so we followed him down a side street. Luckily it wasn’t a mugging tactic, and we were led to a nice little place with a courtyard garden and veranda overhanging the river. 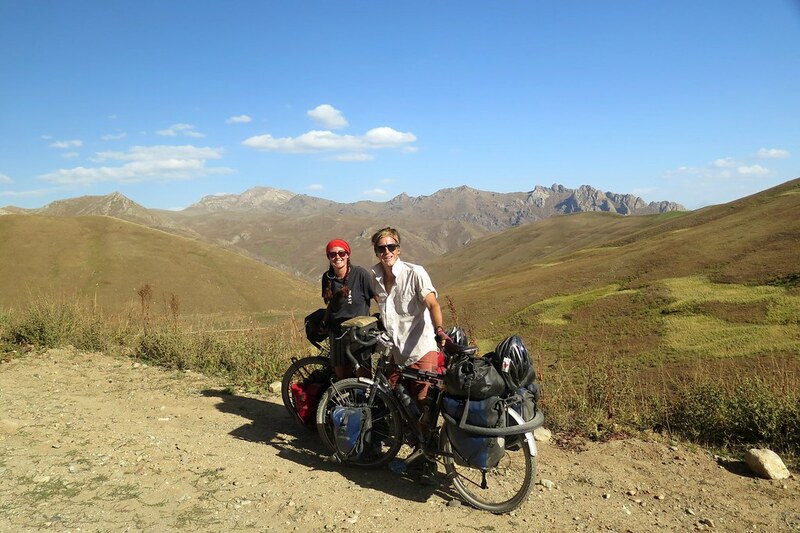 Putting our bikes away in a storeroom, we saw two other familiar looking touring bikes – they were Tim and Claire’s, they’d left Khorog the day before us and were having a rest day. 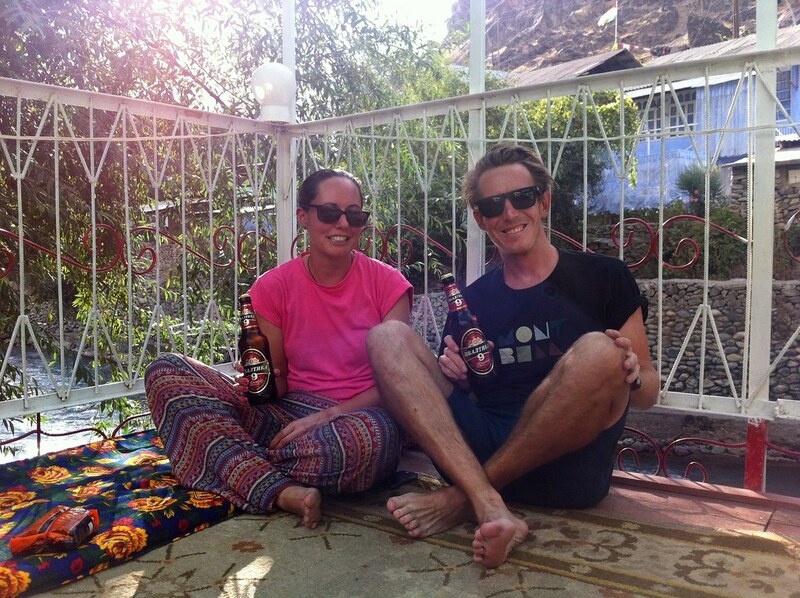 We popped to the shop around the corner to pick up a few beers which we drank on the veranda. 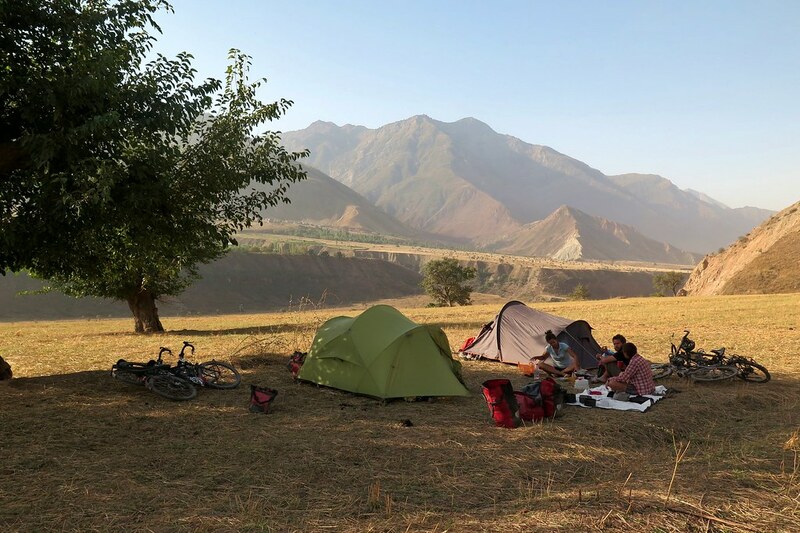 After a couple of drinks, we decided that they’d stick around for an extra day and then we’d ride together for the final few days to Dushanbe. The beers turned out to be 8% alcohol (we didn’t notice when we bought them, honestly) so the extra rest day turned out to be a bonus, giving us a chance to sweat off a hangover, clean the bikes and patch Clare’s puncture. From Qalai-Khumb the road splits giving us the choice of the northern or southern route. 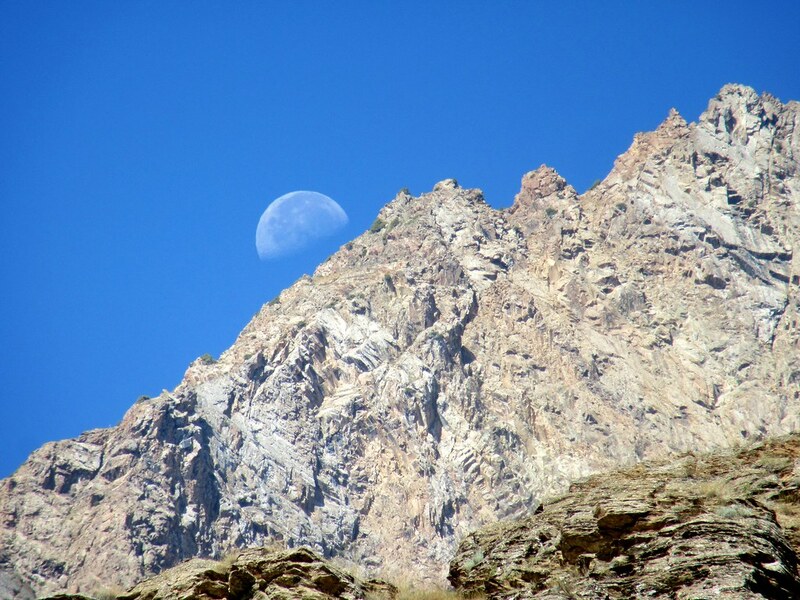 We’d already decided we’d go north, which meant taking on one final high pass, up to 3,252m. We were down at 1,200m so it was going to be a big day of climbing. 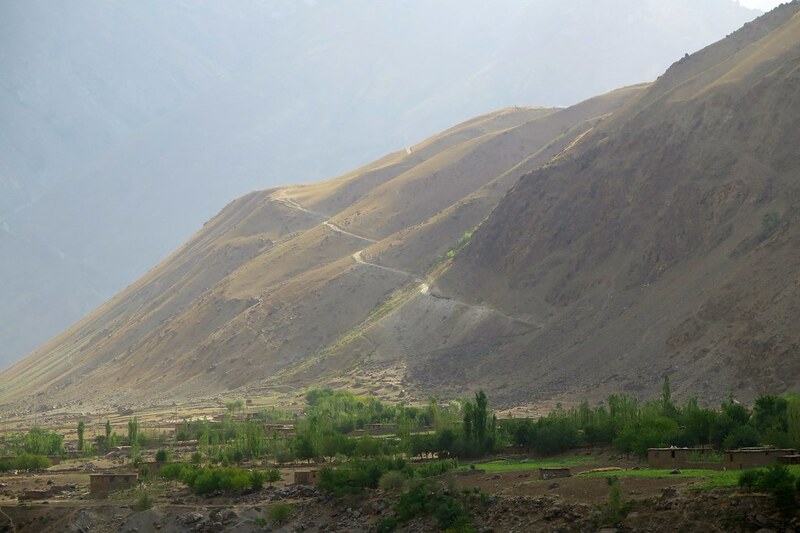 The four of us set off early, leaving the Panj river and Afghanistan behind us, heading up a side valley and immediately starting to gain altitude. We had a bonus 10km of good asphalt to start with, but then we reached a passport checkpoint after which we were back onto dirt. We knew this one was going to be tough, and so took it slow. Clare and Claire both powered ahead while Tim and I hung back, taking our time. 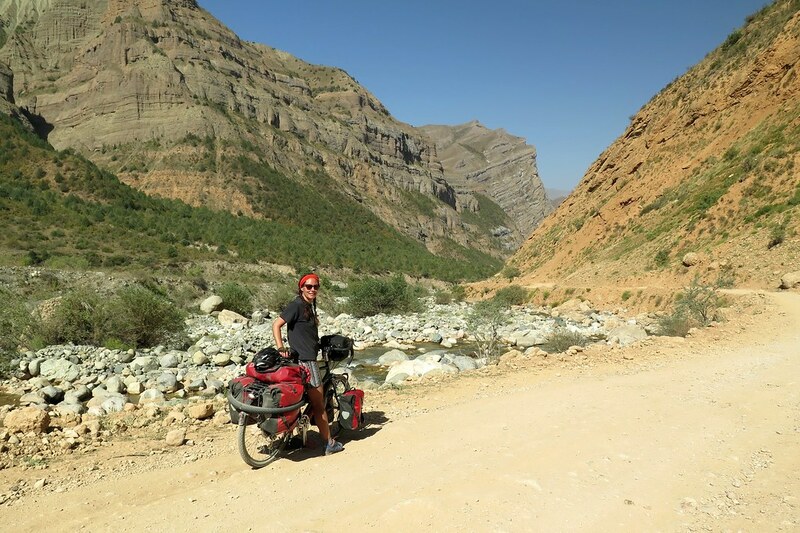 (To be fair to Tim, normally he’d be much quicker, but he was suffering from a bit of a stomach bug so was low on energy, or maybe it was a two day hangover… ) We climbed up through numerous switchbacks and up past sheer cliffs beside the road. The company and the scenery definitely took our minds off the steep road. After a lunch break and by mid afternoon we were nearing 3,000m and reached a wide grassy plateau where the gradient started to ease off a bit. We passed a Dutch girl cycling alone who told us we only had a couple of kilometres to go. With morale on a high and Tim feeling a little better we pushed on to reach the pass, marked by a bus shelter with the altitude spray painted onto it. We stopped at the top for a rest and a Snickers but it was 4 o’clock and felt chilly when we stopped cycling. After 10 minutes or so we started down the far side of the pass, into a much greener landscape than on the other side. We were low on water so needed to get down to a water source before we could stop and pitch our tents. About 12km of rattling down the dirt road we reached an army checkpoint with a spring where we filled up our water bottles. Just around the corner we found a nice patch of flat grass with a view down the valley which we decided to make our home for the night. We were still at altitude, so it got cold once the sun went down but we still sat outside chatting for a while, watching the stars and passing around the cognac. 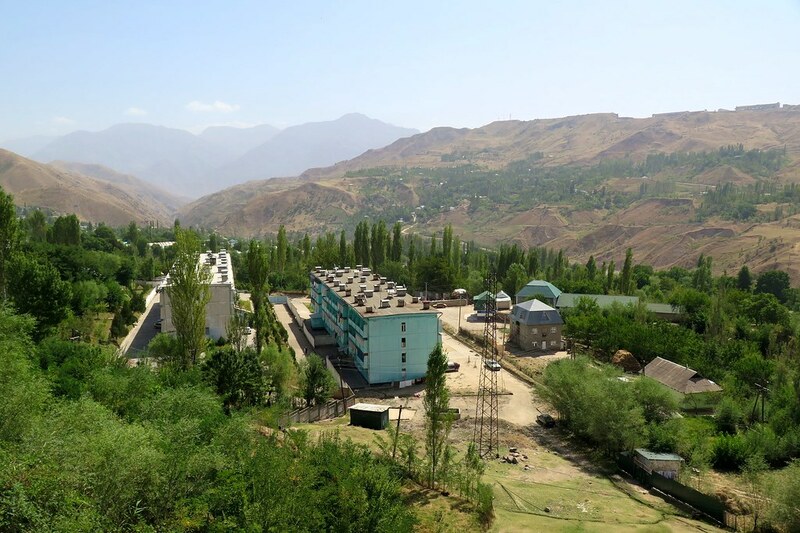 From here it would be (mostly) downhill following a river to Dushanbe. From our campspot we still had a nice long descent taking us through a really beautiful canyon. Not knowing too much about this stretch of the route was giving us some awesome unexpected suprises along the way. The canyon opened up into a wider, green valley near Tavildara where we stopped for a lunch break and to stock up in a magazin. From here on the road was pretty bad. Earlier in the summer there had been heavy rainfall and big floods which washed away a lot of the road. We saw a number of bridges that had been wrecked by the floodwater and we had to cross big sections of road that were in terrible condition. The valley was opening up though, and we were able to find water sources and good camp spots inbetween the stretches of rocky landslide and flood debris. The roads were definitely taking their toll on the bikes. The constant dust and grime made cleaning off the chains an almost daily task. My front hub had started to develop a very slight wobble and one of Clare’s gear cable housings had split. A duct tape repair on the cable housing meant she could at least use the first and second chainrings, but we were definitely going to need a bike shop once we reached Dushanbe. We did start to reach patches of better asphalt, but as soon as we got our hopes up that we’d reached the main road, we were back on to dirt again. Late one afternoon we met a group of four British cyclists, John and Martin from Manchester, and Rach and Nico from Devon (who are on their honeymoon). 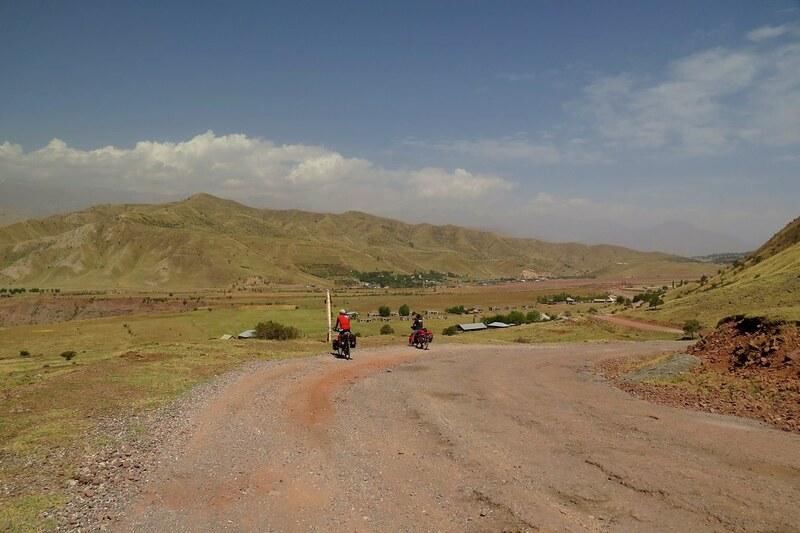 We spent a good hour chatting with them and they gave us good news and bad news – from a few kilometres ahead, the road was smooth all the way to Dushanbe, but we had quite a big climb ahead. 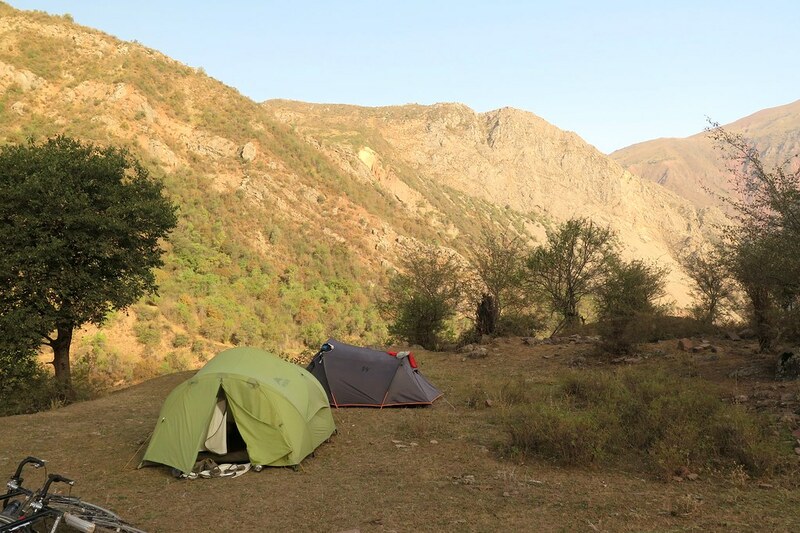 With that in mind, we decided to camp nearby for the night and take on the climb with fresh legs the next day. 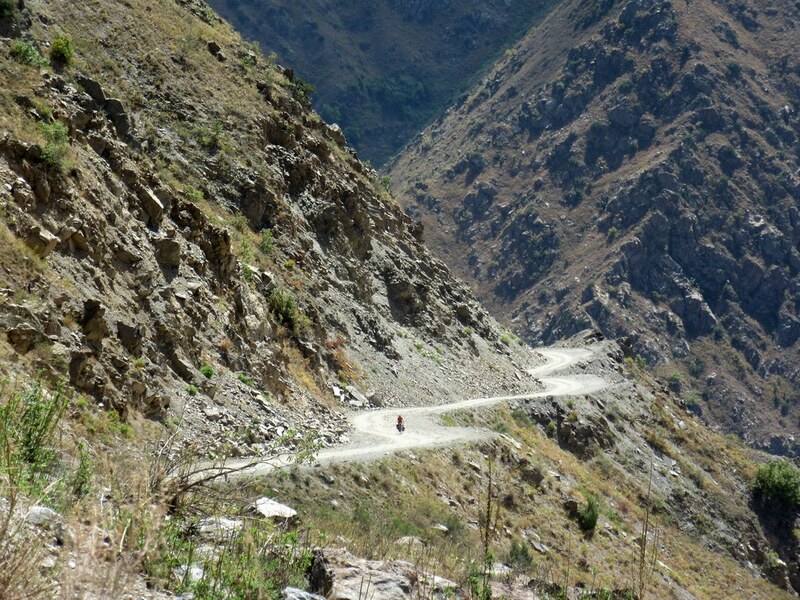 Finally onto a good asphalt road, we started climbing away from the river and up a narrow valley towards Obigarm. We passed a huge construction project, which looked like a planned hydro-electric dam and related infrastructure. Suddenly we felt like we were getting back into civilization. We stopped in the hill town of Obigarm for some lunch and then continued upwards. It wasn’t a steep up, but a consistent climb that lasted several hours. Not too bad on the smooth roads though. Once we reached the top, the road flattened out and we started to make up some good distance through the afternoon. By the time we stopped for the day, we’d covered 72km. That evening, both of us started feeling a bit sketchy. First Clare retired to the tent shiverring, despite the warm night. A couple of hours later I felt the same and we both made numerous trips out in to the bushes with dodgy stomachs through the night. Our cockiness at not getting sick on the Pamir Highway was coming back to bite us. Neither of us slept well and the next morning we felt weak and not really too keen on cycling. 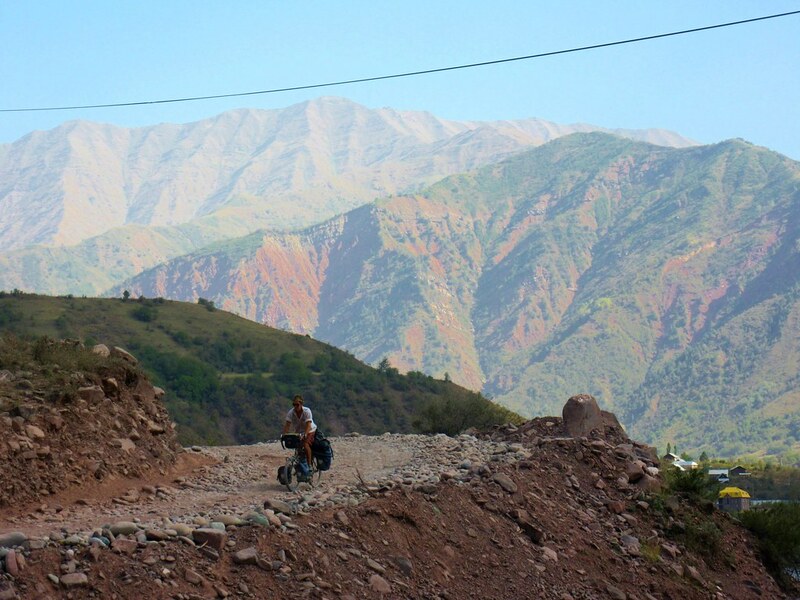 Luckily, we’d left ourselves a short day to get in to Dushanbe, 37km mostly downhill. In a bit of a daze, and disappointed to be finishing this part of the ride feeling like crap, we set off, just wanting to get into the city and find a bed and a private bathroom! 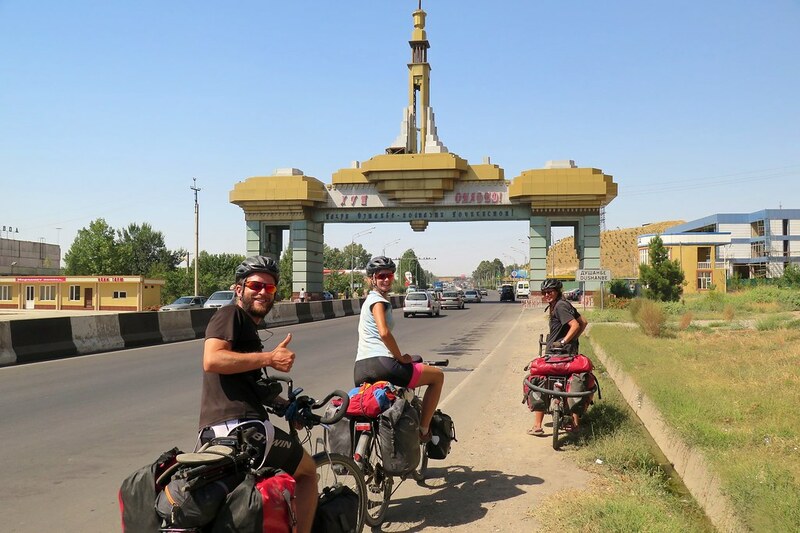 A tailwind helped us along and we arrived in a couple of hours, posing for a photo at the sign welcoming us to Dushanbe. We got into a hostel at around midday and felt a bit better later in the afternoon and into the evening. Over the next couple of days we felt much better and set about the usual tasks that need to be done when we spend time in a city. We managed to get the bikes sorted in the bazaar, updated the blog, and did various other bits and pieces. The Irish pub and numerous restaurants in town gave us the evening entertainment, in the company of Tim and Claire who are also staying here for a while before their Uzbek visas start. We moved from the hostel to go and stay with Vero, a very well known Warmshowers host. 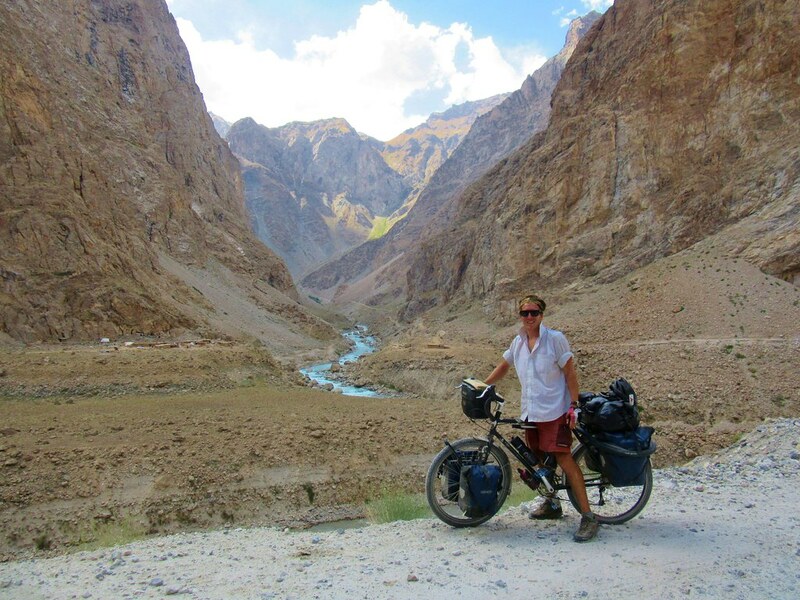 She’s a French expat living here and it seems like she’s hosted almost everyone we know who’s cycled through Central Asia. 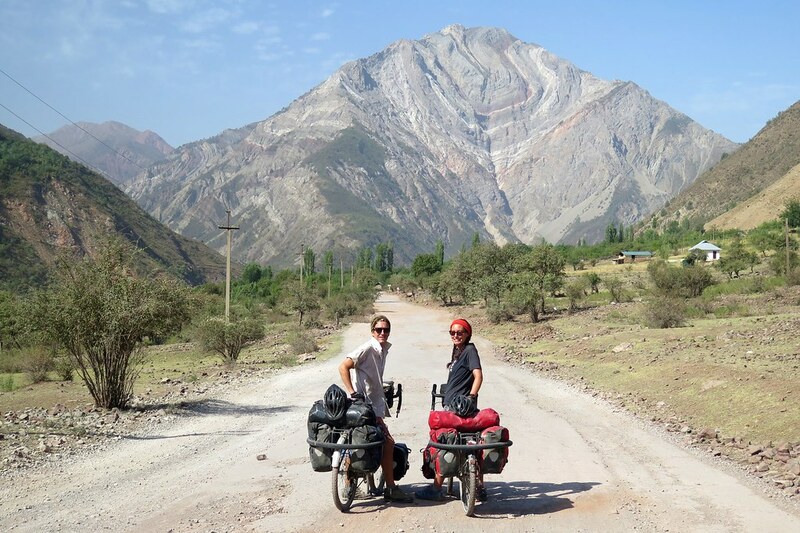 She kindly put us up for a couple of nights and gave us some great information about the Fan Mountains, where we went for a short hiking trip without the bikes (blog post on that to follow!). She even lent us backpacks for the trip! Thanks for your amazing hospitality Vero! You are all incredible cyclists. !